Wendi from Shiny Happy World posted about a quilt along and I was immediately on board. A quilt has been on my list of things I want to do for months, and I was always overwhelmed by where to start. There are so many fantastic quilt designs and patterns, but they all seem very intimidating. 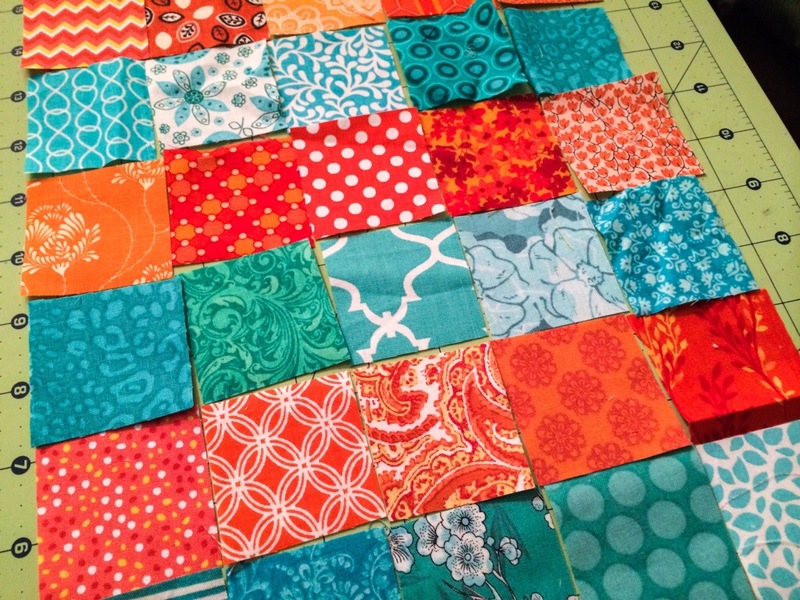 But the idea of doing one quilt block a week seems much more attainable. I had never used a rotary cutter before, I just cut my hexagon fabric by hand because precision isn’t super important. I was pleasantly surprised with the rotary cutter, I got the hang of it and was able to cut out the 2″ squares pretty quickly. 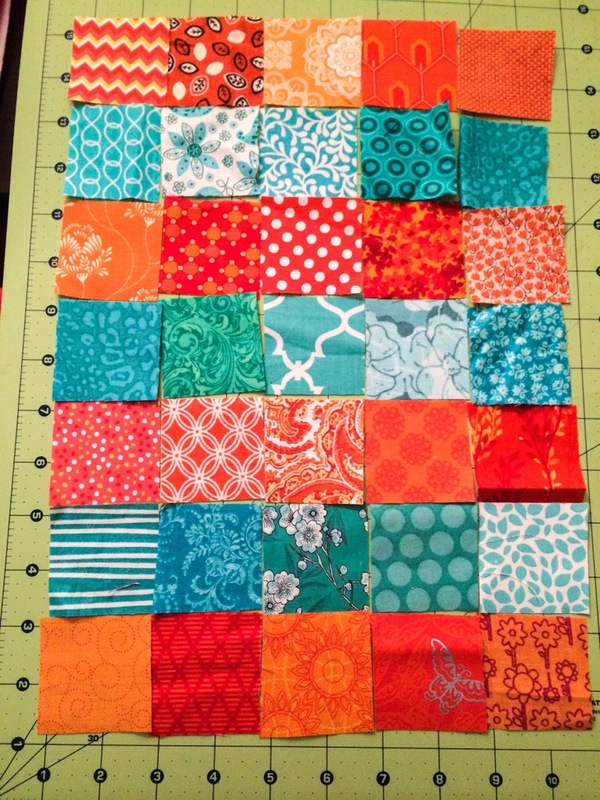 I chose orange and aqua for my first square and used the many, many scraps I have from my hexagon quilt. 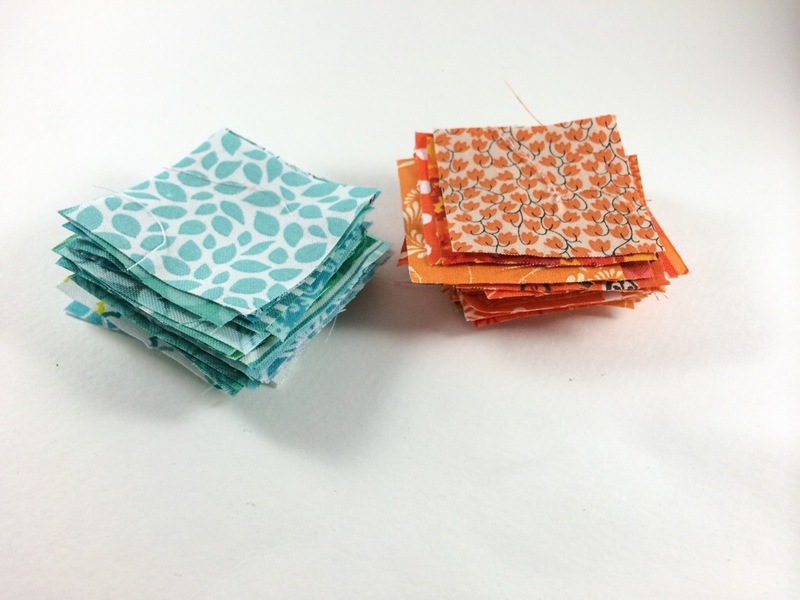 I have two bins of 2.5″ scraps sorted by color, so it was pretty easy to get the squares cut to 2″. I’m hoping to sew the squares together this weekend and I’m eagerly awaiting the next week’s square that Wendi had come up with. Is anyone else joining in on the Controlled Chaos quilt along? Read more about it here. Nice block!! This sounds like fun, and by the way once you make one quilt you can’t stop!!! I can definitely see how this could be addicting! Congratulations on making the move to a rotary cutter. Now that you’ve experienced it, you’ll never want to go back. Just a tip — keep an extra blade or five around. It’s easy to nick one when you are just starting. (Or it was for me!) And don’t be afraid to change blade when one starts hanging up. You won’t be sorry. You can save your old blades in one of those handy plastic things new ones come in, and use them for paper or other odd things, and when you become a fanatical quilter, you can get a sharpener! Thanks for the tips! I was really nervous to try using a rotary cutter, I really hate using an Xacto knife and I thought it would be equally as awful. I was pleasantly surprised and I really enjoy it! I was looking at a rotating cutting mat and considering getting one, it seems really handy! You definitely need a rotary cutting mat. They are “self-healing” which means that as long as you make vertical cuts, you can’t see the slits, but if you cut at an angle (wrongo) you’ll cut v’s into it. If you’re cutting on glass like with an Xacto you’ll dull blades quickly. And get at least an 18 x 24, if not a 24 by 36. I have a couple cutting mats from when I was in art school and cut a lot of mat board. I never realized that cutting at an angle was the reason it left marks! I was eying the 8×8″ Fiskars rotating cutting mat. It seems handy for cutting squares!